Platyhelminthes - flat worms, flukes, tape worms, etc. About 25,000 living species have been described. They have true bilateral symmetry, a cellular layer (parenchyma) between the epidermis and the gastrodermis, and dorsoventral flattening of the body. They have no blood or circulatory system. The Trematoda are endoparasitic with a complicated life-cycle. They are mainly parasites of vertebrates (the definitive host); the most common intermediate hosts are Molluscs. There are around 12,000 species, and the adult size range is 1 cm - 6 m. Their epidermis is syncitial as in the Monogenea (see below), and they have various suckers, hooks and attachment organs; the most common arrangement being an oral and mid-ventral sucker, as is found in the liver fluke. Trematodes of the Schistomatidae family have separate sexes (unusual for Platyhelminthes). The males are shorter and fatter than the females, and have a ventral groove (gynecophoric canal) along their body into which the female can fit. Schistosoma mansoni (above) causes the disease shistosomiasis which infects around 200 million people world-wide, causing body pain, anaemia and dysentery, and kills over 250 000 every year. It is fairly common in wet-rice fields. The fertilized eggs break into the host's bladder and pass out with the urine into the soil. The larva, called a miricidium hatches and enters the body of a snail. Within the snail's body cavity it grows into a large sac called a sporocyst, and this then hatches into a further larval stage called the redia. The redia has a mouth and gut and migrates to the snail's digestive gland. The redia develops into a tiny version of the adult form called a cercaria which drills out of the snail and into water where it enters the human either through the skin or mouth. The cercaria of another species of schistosomatidae occasionally burrows into human skin only to die and cause what is commonly known as "swimmer's itch". The common sheep liver fluke, Distomum hepaticum or Fasciola hepaticum has the dwarf pond snail as its intermediate host, and is another common trematode. The adult fluke lives in the bile passage in the liver of sheep, other ruminants, or even man. The eggs are passed with the faeces. After hatching the enter the snail. Pass out of the snail and encyst on vegetation, which is eaten by the definitive host. The Monogenea and the Trematoda (above) are commonly known as flukes. There are around 1100 species. They differ in two main characteristics. The Monogenea are mainly ectoparasites of fish and have a simple life-cycle involving only one host; whereas the Trematoda are mainly endoparasitic and have a more complicated life-cycle involving more than one host. The Monogenea have an attachment organ, usually a sucker called the opisthaptor (see Gyrodactylus cylindriformis, below), around the mouth and a posterior attachment organ that can also be a sucker, or hooks or clamps. Their epidermis is syncitial (many nuclei with no, or little, separation between cells). Monogenea larvae are free-swimming. These are commonly known as the tapeworms, and are adapted for parasitizing vertebrate guts. There are around 3,500 species described. They are usually less than 1 mm thick but some individuals such as Taenia sp. (below) can be as long as 30 m, for an even longer tapeworm see below. The intermediate host can be a vertebrate or invertebrate according to species. 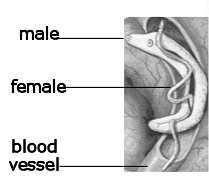 In the vertebrate gut they are surrounded by food so have no need for a mouth or gut of their own. Nutrients are absorbed directly through the surface which has many folds increasing the surface area, and is equipped with a large number of mitochondria. Cestodes have an attachment organ known as a scolex (see above) that is equipped with suckers and spiny hooks with which it attaches itself to its host's intestinal wall. Behind the scolex the body is formed of segments (proglottids), so the oldest segments are at the posterior end. Tapeworms are hermaphroditic and the end segments are essentially just bags of eggs that have been fertilized by sperm from the same segment, a different segment of the same worm, or a different worm. In the photograph above of Taenia sp. the genital pore, which shows up as a bulge on the side of the proglottid can be seen in some. There can be as many as 1000 proglottids in each worm and 100,000 eggs in each gravid proglottid. The proglottids regularly mature and detach and are shed with the faeces of the host. Cows and pigs can act as the intermediate host to Taenia sp., and can infect man when meat is not properly cooked. Dipylidium sp. infect cats and dogs, and occasionally man. The intermediate host is the flea, and the tapeworm passes into the cat or dog as they clean themselves by licking and biting. 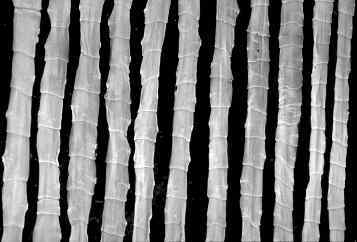 Tapeworms can lead to nutritional deficiencies in the host. Polygonoporus giaganticus lives in the guts of sperm whales. It can grow to 40 m long with 45,000 segments. Each segment has 4 - 14 sets of genitalia. It sheds millions of eggs each day, but there is only ever one tapeworm per whale. Taeniarhynchus saginatus (beef tapeworm). Infection can come from eating raw or rare beef. This is the most common tapeworm in humans. Taenia solium (pork tapeworm). Infection can occur when rare or improperly cooked pork is eaten, and can cause epilepsy if the worm lodges in the brain. This is called cysticercosis, and in Los Angeles is the cause of 10% of seizure cases taken to emergency rooms. Cysticercosis affect 41,000 - 169,000 people in the USA. Diphyllobothrium latum (fish tapeworm). Infection can occur when raw or improperly cooked fish is eaten. In the human gut it can grow to 10 m long if not treated. Infection is common in countries where raw fish is eaten, infection is also fairly common around the Great Lakes of North America. There are around 10 million humans infected with this tapeworm at any one time. Diplydium caninum (dog tapeworm). Infection occurs due to unhygienic habits around dogs who have fleas or lice. Vampirolepis nana (dwarf tapeworm). The intermediate host is the flour beetle, and infection in humans is fairly common.